JP1 Remotes :: View topic - for trade? 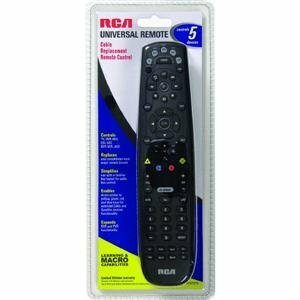 new RCA 5-device RCRP05B remote for JP1.3 cable? for trade? new RCA 5-device RCRP05B remote for JP1.3 cable? Posted: Tue Mar 29, 2011 8:56 am Post subject: for trade? new RCA 5-device RCRP05B remote for JP1.3 cable? I picked up a couple of these so I am willing to let one go in trade for a JP1.3 usb cable? This model is very well documented and supported around here. New, sealed in the original hanging package, ie. You can program almost all the buttons on these even without the cable but the cable will help me reprogram the power button for the DVR which cannot be overridden by typed-code and I have some old JP1.2 devices I'd like to take a shot at. I'd prefer if you were an established member here with at least a few posts and we'd basically mail to each other at the same time via US Mail 1st class.